In this imperfect world, NBA teams are often viewed through two prisms: Either you’re competing for a championship or building with your young pieces. The rest of the teams are painfully stuck in the middle, deciding which path to take. This week we’ll take a look at which teams have the best young cores. But instead of being completely arbitrary, there had to be some level of structure. The players had to be 26 or under, and they were individually ranked in terms of potential in four categories: rotation player, starter, All-Star and franchise player. From there, the value can be a little arbitrary, but without further ado, here are the top young cores in the NBA. They were close to crashing the playoff picture before faltering over the last few weeks, and it would’ve been a valuable experience for a franchise that hasn’t sniffed the postseason in the last decade. But a starting backcourt featuring arguably the league’s fastest player in De’Aaron Fox, 21, and one of the game’s best shooters in Buddy Hield, 26, is fertile land to build upon. Fox made big strides in Year Two, while Hield rewarded the promise of being the centerpiece from the DeMarcus Cousins trade in February 2017. Marvin Bagley III, 20, survived a rocky start in which he wasn’t getting enough playing time but now looks worthy of the No. 2 overall pick. What’s more, they seem to play well together and enjoy it, celebrating in each other’s success — a key in terms of future growth. They each have All-Star potential, but none of them being a true franchise player is what keeps them from ranking higher. One would think the young Celtics would be higher, the products of Danny Ainge’s 2014 fleecing of the Brooklyn Nets for draft picks. The players in their young core performed well last spring when the Celtics came within a game of the NBA Finals. Jayson Tatum, Jaylen Brown and Terry Rozier III all played over their heads to ramp up expectations for the present and even the future, although that’s come to bite them a bit this season as they’ve struggled. Tatum, 21, is the closest to a franchise player, but there’s questions as to whether he’s skilled or athletic enough to carry a franchise should he get the opportunity. Brown, 22, certainly has All-Star potential, but he could be destined to be a solid starter on a title team, like Andre Iguodala. Rozier III doesn’t have the high ceilings of Tatum and Brown, and Marcus Smart has settled into a role as a defensive stopper and irritant — and both just turned 25. The Nuggets have the best of both worlds in a sense. They drafted a franchise player in Nikola Jokic, 24, while also possessing a treasure trove of young players who have potential to grow into star performers. They’ll have decisions to make in the future with Jamal Murray, Monte Morris, Gary Harris and Malik Beasley because of positional duplication, but they’ve seemed to thrive with the competition. Murray, 22, is a hidden gem of sorts who’s emerged this season, showing explosiveness at times. Harris, 24, seems to have curtailed after surprising folks, but he’s a solid two-way player. And of course, there’s Jokic, who’s on the outside looking into the MVP conversation. Whatever you believe he lacks in traditional athleticism, he makes up for with a skillset that’s easy to build around. You have a feeling that no matter how the other pieces around Jokic develop through the years, as long as he’s healthy the Nuggets will be annual contenders. What the Mavs lack in depth with their youth, they make up for with star power. And if stars help usher along rebuilds quicker than solid players, they’re a big step ahead of their competition in the West. Luka Doncic is every bit the prospect he was billed to be before the draft and a likely shoo-in for Rookie of the Year. Whether his long-term position is in the backcourt or at small forward is immaterial. He’ll have the ball in his hands and seemingly can fit in any situation. There are questions about Kristaps Porzingis because of his health and messy departure from the New York Knicks. But with his height and skills, he still has superstar potential — and can share the load of carrying a franchise with Doncic, 20. The 7-foot-3, 23-year-old Porzingis will have to prove himself, more health-wise than anything. A player at his size with lower leg problems will always produce questions, but he was worth the risk for the Mavs. 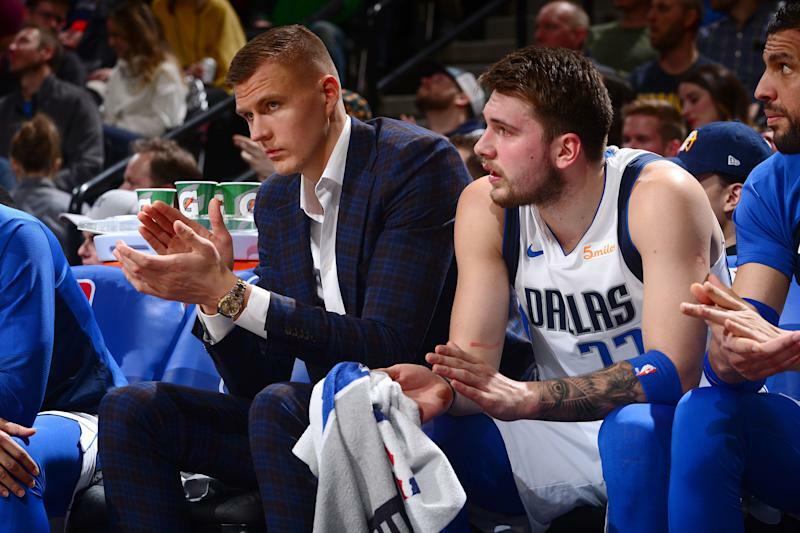 Assuming the two will be able to coexist, the Mavs will return to prominence sooner rather than later with smart draft picks and prudent moves in free agency or the trade market. Easy selection, right? Yes, it was. And, no, this isn't an endorsement of the dreaded "Process" and the embarrassing way the franchise conducted itself for years. The 76ers have missed and missed big (Markelle Fultz and Jahlil Okafor), but they've hit home runs as well. Joel Embiid, 25, is a full-grown man and perhaps the best pivot in the NBA. He can deliver 40-point games, and this season has begun to stretch his range to the 3-point line. Defensively he's a terror with quick hands and a willingness to go after everything. And yes, he's an unrepentant troll, mercilessly needling opposing big men. Ben Simmons, 22, is incomplete, but that doesn't mean he's not a stud with an all-around game. Rare vision complements his size and skill, even with his lack of a jump shot. If the two stay together, they'll have a say in who decides the East for the foreseeable future. Atlanta: Trae Young, 20, is real, and can be an All-Star sooner rather than later in a point guard-laden league. John Collins, 21, has developed into a versatile gem on the interior, sure to wreak havoc as his game grows even more, and a good young coach in Lloyd Pierce is guiding things along. Chicago: Having Zach LaVine (24), Lauri Markkanen (21) and injured-but-promising center Wendell Carter Jr. (19) is legit. Kris Dunn, 25, seems to have regressed a bit, but he's still a solid piece — think Marcus Smart. And after years of misdirection and mismanagement, acquiring Otto Porter, 25, appears to be a sign of competence in Chicago. Phoenix: Front-office direction and player development will be necessary to get out of the cellar. But Devin Booker, 22, is right on the cusp of real stardom, and if nothing else, he wants it. Deandre Ayton, 20, had to take plenty of criticism for not being Luka Doncic, but if he can keep improving defensively, the Suns have two pieces to build around.